The news out of southwestern Pa. this week came from the web cameras set up by the Audubon Society of Western Pennsylvania. The webcams are positioned for bird lovers to see the 24/7 comings and goings of a pair of bald eagles, a species once listed as endangered. Bird lovers can click on the link and view the birds via the internet. Since its inception, the camera has captured the bird pairs overseeing the nest, hatching little bald eagles and the launch of those new birds into flight. 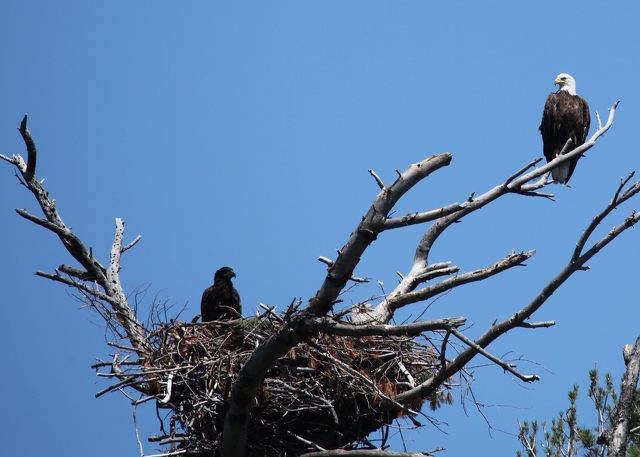 Viewers have also seen eggs that didn’t hatch and eaglets that didn’t survive. The nest residents are seemingly unaware that, like Jim Carrey in “The Truman Show,” the day-to-day details of their lives are being watched by people all over the world. In this juxtaposition of modern technology and Mother Nature, we see how far removed some of us are from the natural environment. What exactly do those who were “appalled” by the video think that bald eagles feed their young? I wonder if the cat in question had ever snacked on a smaller bird? More importantly, is it the ultimate in political correctness to diss a bird who is just doing his or her thing or are people really that oblivious? It reminds me of the story my daughter tells of working the front desk at an island resort. She couldn’t help but smile when a guest called, late one evening, to ask her to please “turn down the frog sounds” outside because the sound was disturbing their family. We really need to get outside more. I watched the images of the bald eagle bringing food back to his or her family. It was uncomfortable to watch although a bunny or a squirrel would have been just as unsettling to me. I get squeamish when I drive by crows when they are snacking on road kill. Everyone has to eat right? The fact that someone may have lost their cat is sad, but animals who are outside without human supervision are opportunities (aka potential meals) for creatures who are further up the food chain. This is a great reminder to all of us who have pets that we care about to keep them inside. My 80-pound Labrador retrievers are likely not at risk for being carried off in the talons of a big bird but the bears in the pictures taken in State College neighborhoods last week might be another matter. Nature, my friends, is just outside our doors. According to the research, we should not only be learning about it, we should be embracing and engaging in it. We’ve known for years that getting out and experiencing the natural environment is good for people. Studies have shown that kids who go outside to play are more physically fit, are better critical thinkers, are less stressed and anxious, show fewer signs of attention deficit disorder and get along better with others. Kids who attend schools with environmental education programs do better on standardized tests in a variety of areas including math, English and writing. Being outdoors exposes us to vitamin D which then positively impacts a variety of health factors. Stanford University studied what they call “rumination” or the internal, self-directed worrying we do and found that people who take walks in nature did less ruminating (versus their control group who walked for the same amount of time in an urban environment). The researchers concluded that less rumination and increased mindfulness – walking in nature – actually changes our brain chemistry and leads to reduced levels of depression and anxiety. Not only do we benefit from being in the natural environment, the natural environment benefits from us being there. People who spend time in nature are generally more concerned with conservation and preservation. Education and exposure to and about the natural world makes us more respectful of that natural world. Take the bald eagles. By adding them to the endangered species list, people became more aware of their dwindling population. Through education, programs to reduce poisons that impact their life cycle and exposure through programs like the bald eagle webcam or the Raptor Center at Shaver’s Creek Environmental Center, the bald eagle is no longer endangered. Nature is right in our backyard. We are so fortunate to have numerous municipal and state parks right down the road from where most of us live. Penn State’s Shaver’s Creek and Stone Valley Recreation Center offer numerous hiking trails and other outside activities. Centre Region Parks and Recreation has over 915 acres of parks at 50 sites including Millbrook Marsh Nature Center as well as other special programs and facility offerings such as the dog park and the disc golf park. The PA Department of Conservation and Natural Resources sponsors Get Outdoors PA which lists activities and events for people to do just that – get outdoors. Summer and nice weather will quickly be upon us. Now is the time to get outside. Don’t be that person who calls to complain about a bird feeding its young or about the volume on the frogs outside. Who knows what you might learn? It may be too early to think about the 2017 NFL Draft. Although the league just completed its 2016 selection process, it will soon forge ahead with its initial evaluations of next fall’s senior collegiate prospects. And those official preseason reports should begin circulating sometime in June.